A pronoun is a word that takes the place of a noun or a noun phrase. Rather than using the same noun over and over again, we use English pronouns. Mr. Hurshee was eating Mr. Hurshee's breakfast on Mr. Hurshee's way to work. Unfortunately, Mr. Hurshee's milk dribbled down the front of Mr. Hurshee's shirt. Now, Mr. Hurshee needs to ask Mr. Hurshee's sister to bring Mr. Hurshee a clean shirt. Mr. Hurshee was eating his breakfast on his way to work. Unfortunately, his milk dribbled down the front of his shirt. Now, he needs to ask his sister to bring him a clean shirt. English pronouns are the words (such as he, she, it, we, they) we use to refer to people, places, and things that have already been mentioned. Pronouns are italicized in the examples below. The noun or noun phrase to which the pronoun refers is called the antecedent. The prefix ante means "before", and the root ced means "go." The antecedent usually "goes before" the pronoun. The antecedent of the pronoun her is "Melissa," and the antecedent of the pronouns it is "armchair." Often we find an antecedent in an earlier sentence. Sometimes the antecedent comes after the pronoun, or it might be another pronoun. A pronoun can also have more than one antecedent. Likewise, a noun can serve as the antecedent for more than one pronoun. Otis (antecedent) had the flu when he ran his first race. The doctor said she eats too much sugar. Who eats too much sugar? What is the antecedent of she? Yin and Eunice painted her fence. Yin and Eunice painted Yin's fence. Just like nouns, personal pronouns refer to people and things (and also places, if you think of a place as an "it"). In the following sentences, the personal pronouns are italicized. First person is the speaker: I, me, mine, we, us, ours. Second person is the person being spoken to: you, yours. Third person is the person being spoken about: he, she, it, him, her, his, hers. Just like nouns, pronouns appear in cases. Case shows the job the pronoun is performing in the sentence. The following chart helps us to sort out the three personal pronoun case forms: (1) If a pronoun is a subject or predicate nominative, it is nominative case. (2) A pronoun used as a direct object, indirect object, or object of a preposition is objective case. (3) If a pronoun shows possession, it is possessive case. 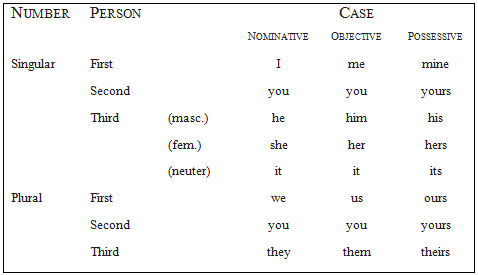 The pronoun case form depends on how the pronoun is used in the sentence. Relative pronouns play the part of subject or object in clauses. Relative pronouns often refer to nouns that have preceded them, making the sentence more compact. Notice that we do not use which for people. In the sentences below, we diagram the dependent clause to show how the pronoun is used. Most offices are closed on holidays. A demonstrative pronoun must agree in number with its antecedent (the noun that it points out). SINGULAR:	This is a plateau. When the pronouns which, whose, or all of the indefinite or demonstrative pronouns come before nouns, they are adjectives. When they stand alone, they are pronouns.